Insights and helpful tips from the bank that's here for you. Much like the sport of baseball, the housing market has something of an off-season that takes place each winter. Of course, there are some eternally sunny, warm-weather climates where both beachfront properties and the national pastime can be enjoyed all year long, but those types of places tend to be either south or west of Kansas and Missouri. In the Midwest, selling a home in the winter can prove as challenging as fielding a ground ball in 6 inches of snow. However, there are a few ways to overcome the odds during this sluggish selling season and actually snag a sale. Your listing photos should show the home at its most appealing, and it's likely that the most flattering pictures you have of your residence were taken on a bright and sunny day. Be sure to include such pics in your listing to help buyers visualize what the home will be like once it's finally warmer outside. On the other hand, you shouldn't only include months-old photographs in the listing, Realtor.com cautioned. Doing so can make a listing look stale and ignored, so put some more recent images in there, as well. Curb appeal still matters, even when the curb is buried under layers of snow and sleet. Washing windows will help let in what precious little daylight you have during the winter, and dusting and vacuuming can keep your home looking fresh during a somewhat dreary time of year. Opening all of the curtains and turning on all of the lights can also aid in the fight against the creeping darkness of the season. Accessibility is also key, which means shoveling and salting your driveway and walkway throughout the winter. It's no one's favorite chore, but it's a must if you are going to have visitors coming to judge the livability of your home. 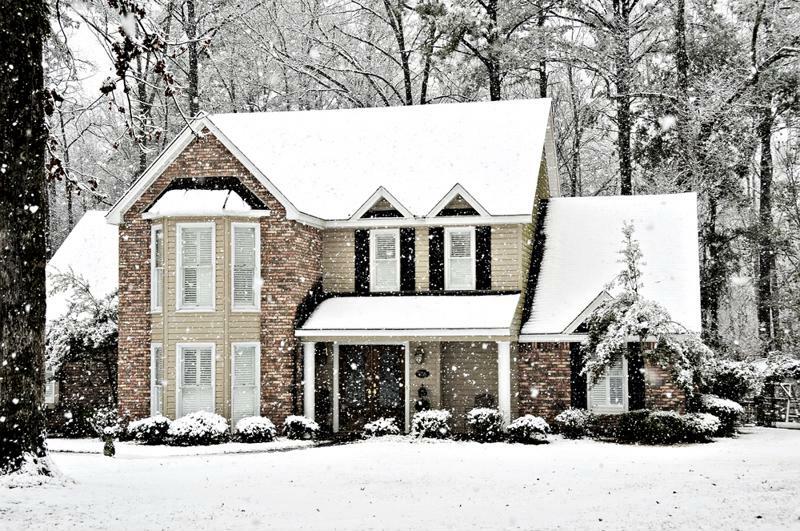 Homes can still look plenty appealing when dressed in white. Play to your home's strengths and find ways to make it feel like a nice and cozy respite from the cold night air. Turn up the heat before guests arrive so that they can heat up quickly, and serve treats like hot cocoa and warm apple cider during an open house event. For a heartier offering, creamy stews and soups can really hit the spot on a chilly day. If hosting during the holiday season, playing some soft, instrumental holiday songs is a great way to put folks in a festive spirit. Don't just tune in to a radio station, as you wouldn't want the carefully curated mood to be broken by some commercial for a local law firm. An album or streaming service should do the trick, though. Many people like to use scented candles or air fresheners to contribute to the setting. However, The Balance warns against that practice, noting that many people are allergic to such products. The best types of aromas are the ones that advertise the home's capabilities, like the smell of freshly baked cookies that you can pull straight from the oven and serve to prospective buyers as they admire your kitchen. The holidays are a busy period, and buying a new home isn't the only holiday shopping that most people have to do during this time of year. Realize that the home purchasing process can be as stressful as the selling process that you're going through, and remain open and flexible to the needs of buyers, especially when it comes to scheduling visitations to show off the house. The holidays are traditionally a time for heading back home, but with these tips, you should instead be able to spend the season unloading one.